The beginning of winter in Chicago can be quite exciting – the anticipation of snow, holiday season cheer, ringing in a new year… then BOOM – January rolls in and the magical part of winter seems to come to a screeching halt. Next comes months of frigid cold, making it seem as though spring is an eternity away. For me, winter sanity is planning something to look forward to – like a nice warm vacation. We decided to book a trip to Florida and try our hand at Disney World for a few days. Cory and I have both been to Disney World when we were little, but this will be our 1st trip as parents… Although all the information for planning a “WDW” vacation can be overwhelming, and some websites even require a secret decoder ring to figure out their acronyms, I find most advise has the same staple suggestions. One of these recommendations is to be prepared with an autograph book for character photographs and signatures. The Disney Store sells autograph books anywhere from $8 to $20, and customizable books can be found on Etsy for up to $75 (you read that right – SEVENTY FIVE!) To sell me on $75 I’d hope for them to be encrusted with princess jewels or sprinkled with Tinkerbell’s fairy dust, but my guess is they are not… I understand some Disney enthusiasts might be willing to fork over that kind of cash for a memory book, but I have 3 toddlers who – to my best guess – will develop stage fright and not even get close enough to the oversized, slightly terrifying characters for me to snap a photograph, let alone ask for an autograph… Don’t get me wrong, I’m all about keepsakes. But if I can create a quality, personalized version myself and save money, I’m definitely going to choose that route. To keep the cost of their autograph books at a minimum, I scoped out Hobby Lobby’s 40% off Art Pads & Sketchbooks sale and purchased 6″ x 6″ Master’s Touch Wire Bound Sketch Books for $2.99 each. Here is a similar Wire Bound 6″ x 6″ Sketch Book from Amazon. Click HERE for editable PDF (accurate print size for above sketch book) or HERE for jpg format. I then personalized each cover using a free New Waltograph font I found on Fontspace.com. Step 1: Select the Edit button from the toolbar at the top of the Preview window. Step 2: Select the Text tool .Step 3: Select the color [white], [Waltograph] font, appropriate size – I used [48 pt], and [center] alignment. Step 4: Click on document and type name / text. Note: You may have to do this a few times to get accurate placement. Printing the images on card stock looked fabulous, but for an extra crisp result – I had them professionally printed online using matte photo paper (Note: Maintaining image size to scale is extremely important). I then trimmed the images with a paper cutter (leaving a white border) and used spray adhesive to attach each design to the kids’ autograph book covers. This photograph shows image printed on card stock. We are now prepared for character autographs… Take us to the mouse! WANT MORE COLOR OPTIONS?? SEE MY NEW POST!! Follow me on Facebook or Pinterest, for more fun and creative ideas! How do you get their names on the pdf document?? Could you send me an editable form of the memories image above. Hi Bridget! Great question… I used a pdf document so print sizing showed accurately but if you don’t have Photoshop, you’d probably like to work with a different format. When you have the pdf document open, you can click ‘File’ -> ‘Export’ and you should be able to save the file in your desired format… For your convieniece I also just added a link for a jpeg format under the image. Once you download the New Waltograph font, you should be able to type over the image in whichever program you are using…. If you need further help, feel free to comment or you can contact me directly using the email form… Thank you for visiting my blog! If you have a Mac, I just added instructions to the blog post on how to add text to the PDF file. Another great free Disney font – Thank you, Dwayne! Do you have a PDF I can download with the pink background or tell me how to change it? Hope you like it. Thank you for visiting my blog! Tanks a lot for your idea ! Can you explain me how can I change the word “memories” in “souvenirs” because we speak french ? Hi Melanie. 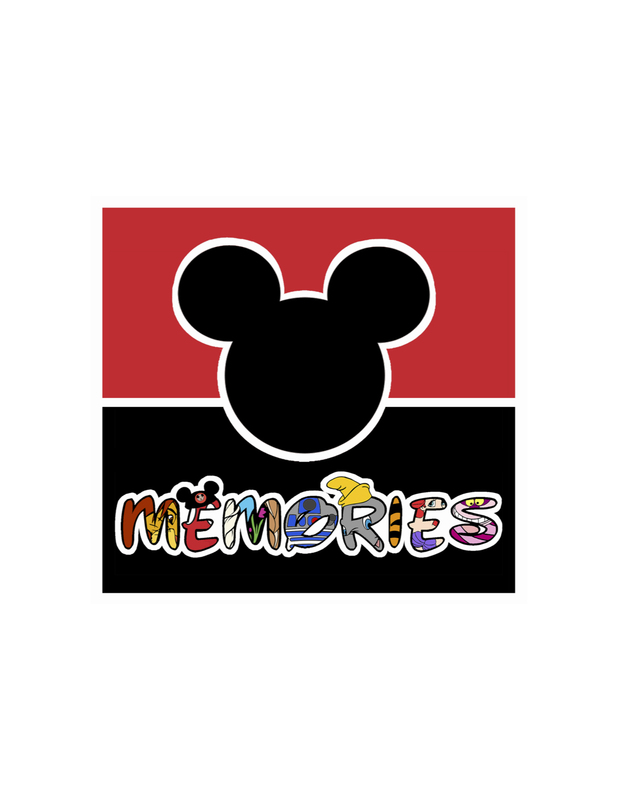 I created “Memories” as an artwork, not a font, so unfortunately there is no way to simply way to change it to “Souvenirs”. Sorry. Hello, I love this idea! It looks so simple and professional. I love the pink background you made. Is there a chance you could do a blue background and a teal one? For your convenience, I just created a new post with a RAINBOW of colors to choose from. Enjoy your trip to Disney and thank you for visiting my blog! I love this idea! You mention having it professionally printed online. Are you able to share who did the printing? Services such as Mpix, Shutterfly, etc… Note: Just make sure to maintain the image size for your cover.